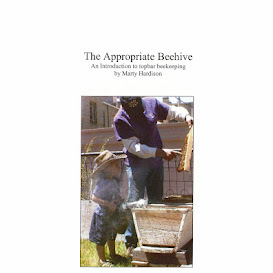 Backyard Bee Hive Blog: How does desensitization work? I keep wondering, why does getting stung by a bee cause an allergy but getting allergy shots fix the allergy? If an injection is the same as a sting, why is the outcome different? In my never-ending quest to understand how sensitization/desensitization works, I found this incredibly educational article, written by a doctor who is also a Master Beekeeper. I need to reread them but I think the answer is in these articles. Posted with permission of Buddy Marterre, MD. Bee Stings: Immunology, Allergy and Treatment, a two part series of articles originally published in the American Bee Journal. "Although it’s part of the business, few of us actually look forward to being stung. As beekeepers we need to know about the various reactions to bee stings and be responsible to ourselves, family, neighbors and friends in regard to bee stings. I hope this article will serve some of those purposes and be informative to both the beginner beekeeper and the most experienced scientist. The first part will cover insects that sting, honey bee stings in particular, bee venom biochemistry, precautions and sting prevention, the management of beekeeping emergencies, and basic immunology and allergy. 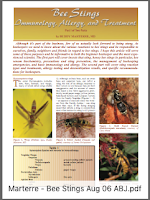 The second part will cover sting reaction types and treatments, allergy testing and desensitization results, and specific recommendations for beekeepers." Click on the thumbnails to read the rest. Dr. Marterre requests that you not download his articles without his express written permission. Contact me for his email address. Thanks for posting. Good articles.